If you're like me, you keep some fairly important things in your iPhone Notes app, and you're pretty devastated when the notes are suddenly missing (which has happened to me). There are a few different ways your iPhone notes are stored, so we're going to review the various ways you can try to recover the notes. 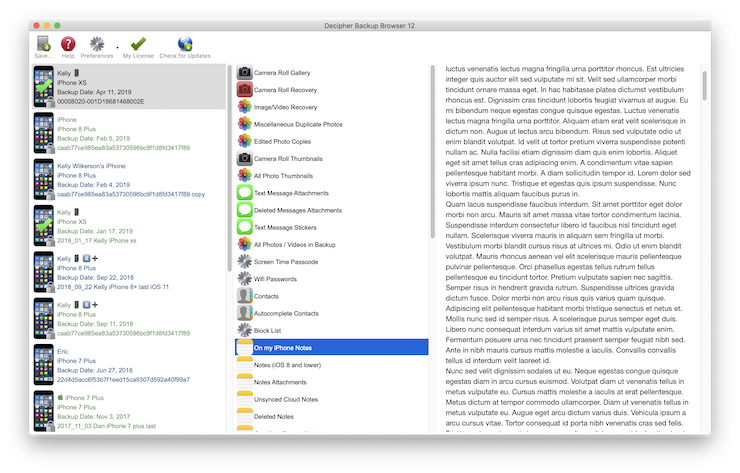 TL;DR: You can extract your missing notes out of your iPhone, iPad, and iPod Touch backups by using Decipher Backup Browser. First, please don't plug your iPhone into iTunes right now! We don't want to accidentally trigger a backup that would overwrite your previous backup with the notes intact. Ok, on to real suggestions now :). Next, in the Notes App, if you're not currently on the screen "Accounts", click the back arrow in the upper-left corner of the screen until you are at the Accounts screen. Try selecting "All Notes" to make sure you're seeing notes from all of your various accounts (on your iPhone, Gmail, iCloud, Exchange, etc.) Hopefully, your note now appears, and it just was in a different account than what you were looking at! If not, go back to the "Accounts" screen again, and take note of what various cloud-syncing accounts are there. It's possible that the note may still be on your account, or that note syncing was disabled on one of your accounts and needs to be turned back on again. Now that we have a sense of where your iPhone notes are stored, we're going to go through some of the common scenarios for how the notes have gone missing, and how to fix it or recover them. If you think there was a cloud account (like iCloud, Exchange, or Gmail) missing from the list of accounts we just looked at, your notes may be missing because note syncing got turned off for that account somehow. We're going to show you how to turn note syncing back on, but before we do this we're going to show you how to look at the notes in a cloud account manually, just in case syncing merges the notes incorrectly and deletes the copy on the cloud server. If you have some cloud accounts (like iCloud, Exchange, or Gmail), we're going to show you how to look at your cloud-stored notes manually to look for the missing note on your cloud server. If the missing note was stored on the iPhone, we're going to have to dig the note out of a backup. We can also use the backup to get our missing notes for cloud-synced notes, since those are copied to the iPhone and stored in the backup as well. You can use our Decipher Backup Browser to save the missing iPhone notes from a backup of your iPhone made in iTunes. Download Decipher Backup Browser from our website, install and run. Decipher Backup Browser will automatically scan for your existing iPhone backups. If your backup is encrypted, you will need to enter the encryption password to view notes for that backup. Click on each backup you are interested in, and click on the Notes entry in the center of the window. If you see your missing notes, click Save and save to get a copy of your notes in a file! From here you can send relevant text to to your iPhone via email and copy and paste it back into a note. Or if you are on a Mac, you can copy and paste the text back into the Notes app for Mac to sync it back onto your iPhone, iPad, or iPod Touch. Even though the note is missing from the iPhone itself, we may luck out and find the note still alive and well on the cloud. I've definitely rescued a note or two from my Gmail-synced notes in the past. If you sync notes via iCloud, you can go to the iCloud website, and specifically the notes section https://www.icloud.com/#notes to view all of the Notes currently stored in your iCloud account. If you find the note, or remnants of it, click the Email button at the top of the note to send yourself the note text, just in case. We may need to just disable and re-enable iCloud syncing on your iPhone to get the note back. If you sync notes via Gmail, go to https://mail.google.com and login with your Google Account. In the list of various mail folders along the left side of the window, click on "Notes." Hopefully, you will find the note text here. If you do, copy and paste that text and send it to yourself in an email just in case! We may need to just disable and re-enable Gmail syncing for notes on your iPhone to get the note back. Tap on the account you want to adjust note syncing for.